Camping offers the perfect opportunity to go on holiday without damaging the environment unnecessarily. Camping doesn’t have to mean staying in a tent either, although it can. It could also mean staying in a caravan or mobile home. As well as being environmentally friendly, camping holidays are also cheaper than many other types of holiday, such as package deals, hotels abroad and even chalets in holiday camps in the UK. 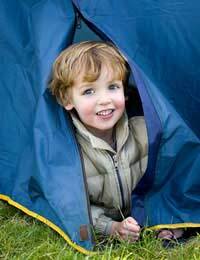 Camping holidays are great for families looking to reduce their carbon footprint and still have fun on holiday. They’re also an excellent choice for just about anyone looking for an eco-friendly getaway, including couples, groups of friends and interest and activity groups, such as walkers, ramblers and climbers. Green Camping: Where To Go? It’s possible to have an eco-friendly camping holiday here in the UK or abroad. Bear in mind though that the further you go, the bigger your travel carbon footprint is likely to be. More and more companies are waking up to the importance of (and the commercial possibilities for) eco-holidays. Campsites are increasingly advertising their green credentials and throwing in environmentally responsible extras such as locally sourced food and bike hire. Of course, campers don’t have to stay on a campsite. Some people just travel around and see where the wind takes them, and there they set up their tents. Obviously, be careful of private property and always bear your safety in mind. Camping is one of the most eco-friendly holidays you could choose. However, the story doesn’t end there. It’s important to continue this environmentally responsible behaviour throughout the trip. Have a rule. If you took it with you, make sure it returns home with you. In other words try to leave the area you camp in as you found it when you arrived. Bring re-usable crockery and cutlery with you. Washing up doesn’t take long and it will drastically reduce the amount of waste your produce. Think how many disposable plates a family would go through in a week of camping. Think about how you travel to your camping destination and how you get around while you’re there. Consider whether you could ditch the car altogether and travel by train or even bike instead. Use LED torches and lamps. LED torches uses less battery than traditional torches and often produce a brighter light. Wind-up lights are also worth considering. Although the light the produce isn’t as bright as LED torches, they are handy for camping trips. Make sure you carry on recycling whilst you are camping. There may well be somewhere on site to recycle. If not, collect the recycling in bags and recycle it appropriately on your way home or when you arrive. It can be a good idea to think of a green camping holiday as ‘a break away from it all’. That means ditching electricity and gadgets where possible There are a few luxury items that are worth investigating though, and they’re still green. For example, solar-powered showers are now available in camping shops and are reasonably priced.